The key-value data store you love, with the developer experience you deserve. Don't have a Heroku account? We’ve enhanced Redis, the world’s most popular key-value data store, with a robust developer experience to make building data driven apps even easier. Heroku Redis lets you gain greater visibility into performance, better manage your instances with a powerful CLI and easily federate data with Postgres to gain business insights using familiar SQL tools. Let our experts run your Redis instance so you can focus on what matters, your app. Heroku Data Links brings the big picture into focus by enabling you to wrap your Redis data within Postgres. Draw insights from all of your data with SQL and the powerful features built into Heroku Postgres. Performance Analytics surfaces key runtime metrics like number of calls per command, active connections over time, the number of keys in play, and memory being consumed, on a unified time axis. Fine-grained logs from your Redis instance join your application’s real-time aggregated log-stream and can be consumed via the new Heroku Redis CLI plugin or any of the many logging-related Heroku Add-ons. 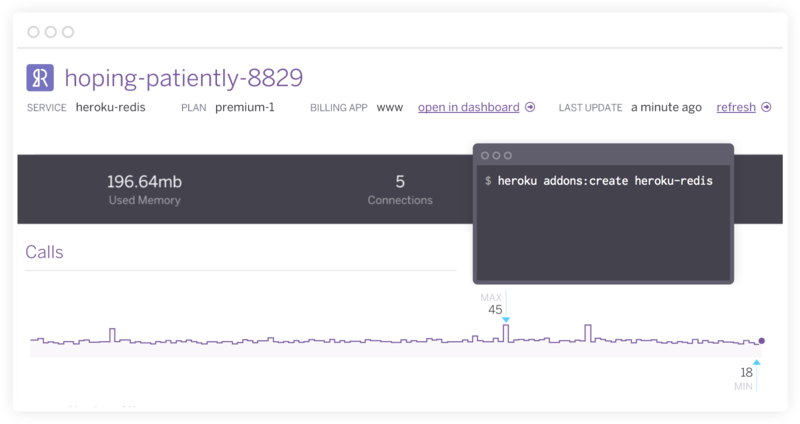 Provision, connect, and configure Heroku Redis from the comfort of your command line with the Heroku CLI. The Heroku team has more experience and world-class expertise running large scale data stores as a service than anyone. Let us run your Redis instance, so you can focus on what you’re great at. Where application uptime is critical, Heroku Redis Premium plans offer higher availability through low latency failover of your Redis instance. We’ll take care of uptime, so you can focus on what matters, your app.